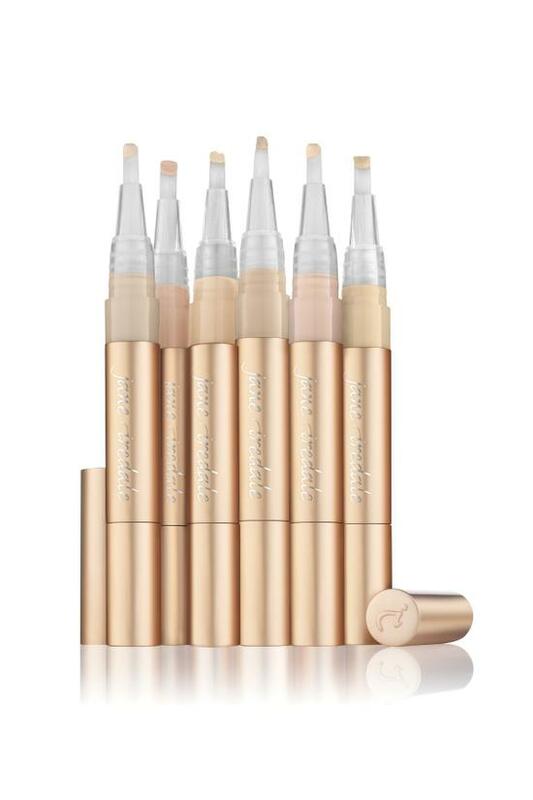 An under-eye concealer and facial highlighter that refracts light for a soft-focus finish. It provides sheer to medium coverage for under-eye shadows and conceals while it brightens. Cucumber and White Tea Extract calm tired eyes and help to reduce puffiness. While Crambe Maritima Leaf Extract helps to lessen the appearance of dark circles and also helps to reduce puffiness. The added benefit of Avocado and Sunflower Oil gently nourishes the delicate eye area. 0.07 oz. Slowly twist tube from the bottom until a small amount is visible on the self-contained brush. Very little product is needed for complete coverage. Apply to the whole under-eye area and even around the nose, lips or any area that needs highlighting. The brush is designed to fit easily into the recess between the nose and the inner corner of the eye. Active Light will appear to pull that area out. Use the Camouflage Brush or fingertip to feather the edges. Follow with any of the mineral foundations if needed. Isopropyl Jojobate, Isostearyl Neopentanoate, Persea Gratissima (Avocado) Oil, Helianthus Annuus (Sunflower) Seed Oil, Titanium Dioxide, Beeswax, Hydrated Silica, Copernicia Cerifera (Carnauba) Wax, Ozokerite, Boron Nitride, Polygonum Fagopyrum (Buckwheat) Seed Extract, Cucumis Sativus (Cucumber) Fruit Extract, Camellia Sinensis (White Tea) Leaf Extract, Bisabolol, Rosmarinus Officinalis (Rosemary) Leaf Extract, Ascorbyl Palmitate. May Contain: Mica, Iron Oxides, Chromium Oxide Greens. Isopropyl Jojobate, Isostearyl Neopentanoate, Persea Gratissima (Avocado) Oil, Helianthus Annuus (Sunflower) Seed Oil, Titanium Dioxide, Beeswax, Hydrated Silica, Copernicia Cerifera (Carnauba) Wax, Ozokerite, Boron Nitride, Polygonum Fagopyrum (Buckwheat) Seed Extract, Cucumis Sativus (Cucumber) Fruit Extract, Camellia Sinensis (White Tea) Leaf Extract, Bisabolol, Rosmarinus Officinalis (Rosemary) Leaf Extract, Ascorbyl Palmitate. May Contain: Mica, Iron Oxides, Chromium Oxide Greens.